Ariana Tsuchiya’s passion for wine came to her during a study abroad in Tuscany, Italy. It was there that she experienced her first wine tasting, and she became so intrigued that she started teaching herself more about wine. As she researched through materials she could find online, she discovered that people could actually have professions in the wine industry. Following her passion, Ariana quit her former job and returned home to Hawaii. The first and only job she applied for was at Alan Wong’s Honolulu to be a bar porter. 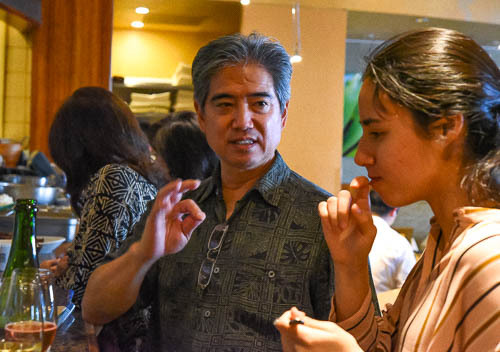 In her time with Alan Wong’s Honolulu, Ariana has progressed not only in her studies, but also in her role at the restaurant. She was recently promoted to Sommelier from being a food runner and a bartender, which allows her to gain more experience engaging with the guests. Going through different positions in the Front of the House enabled Ariana to gain useful experience on the restaurant floor. In addition to having to learn more about food, Ariana also gained valuable experience interacting directly with the guests at their tables. Ariana is also diligent about her studies and has passed the second level of certification by the Court of Master Sommeliers. Additionally, earlier this month, Ariana entered the Young Sommelier international competition sponsored by the Chaine des Rotisseurs. This is open to all young service professionals under 30 years of age. She was selected to move onto the second stage of the competition, doing well in her online Q & A exam to qualify. Through her passion to learn more, Ariana has achieved much in a short period of time, and the team applauds her accomplishments and her efforts. We support her endeavors and wish her all the best as she continues on in her pursuit of personal excellence.